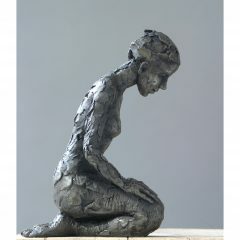 Founder of the Bristol Drawing School, Carol Peace is a figurative sculptor who could not work without drawing. The process of drawing, that intuitive response, is what she aims for in her work. In 1992, Carol Peace graduated from Winchester School of Art and set up studio in the Bristol Sculpture Shed, which would later become Spike Island, she moved to Paintworks in 2004. Carole’s intensely personal work is shown and collected all over the UK, Europe, the Far East and United States. Her large-scale work is permanently on show at Glyndebourne and at the Dorchester’s country house hotel in Ascot. The sculptures are made in clay, which like charcoal is quick to make marks with, once finished it is cast into bronze, those fluid marks of the making are then fixed forever.